Front of abdomen, showing the large intestine, with the stomach and small intestine in gray outline. 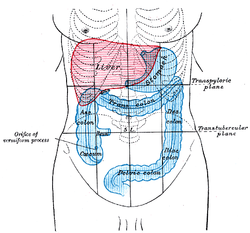 Front of abdomen, showing surface markings for liver (red), and the stomach and large intestine (blue). The large Intestine is like an upside down U. ↑ "large intestine". NCI Dictionary of Cancer Terms. National Cancer Institute, National Institutes of Health. अभिगमन तिथि 2014-03-04.